Breaking: New CLAMP "Tsubasa" series to begin in August! Breaking news for Tsubasa fans! 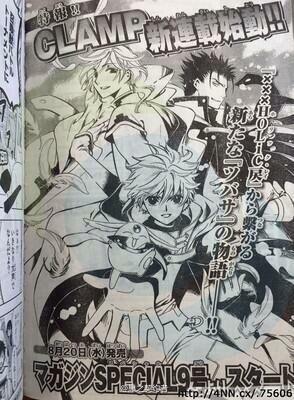 It's been announced that a new "Tsubasa" series will begin on August 20th in Kodansha's monthly Magazine SPECIAL. The series will be linked to the currently ongoing XXXHOLiC Rei series. Special thanks to Newsmangajapon for letting me know! I have mixed feelings about this. I am sure the community will be more than happy to see this news, but I wish CLAMP would just move on. The least I can do I hope we will now get all the answers that we didn't get in the first place.